Even so, I was surprised when Laura gave the OK for me to go to the Confluence Watersports Friends and Family Kayak Sale and shop for another boat. The Friends and Family Sale is held at random times at Confluence’s manufacturing facility in Easley. This is the traditional home of Perception Kayaks, but Confluence has also bought up Wilderness Systems, Dagger, and Mad River Canoes. All of those brands were available. Chip designed the websites for all of those brands, so he gets the alerts as to when the sale is taking place. The boats for sale include used boats, demonstration boats and factory seconds. The prices are fantastic, but you have to look over the boats carefully. Last year one boat that Chip bought had a warped hull, and has a definite pull to the right. The boat I got had all of the seating straps cut, but I was able to repair it. Chip, Houston, and several of Chip’s co-workers headed over early for the sale. From 8:00 am until 9:00 only employees of Confluence are given first dibs. We stood around and watched in frustration as boats we had an eye on slipped away. At 9:00 it was the general public’s turn. I was shopping for three boats – a tandem for Laura and me, a Pungo 120 for Alan, and a Pungo 100 for my niece. Houston and Chip were after fast touring boats. The Pungos were going fast. They are fun, fast, and great for beginning paddlers – possibly the best starter boat around. I managed to snag the last 120 and 100 on the lot that were in good shape. Laura had given me a price limit on the tandem. We wanted one so that we could take one boat with us to Florida or the SC coast. The boat also needed to be configurable for solo paddling. I found a Pamlico 145T that looked like it was in pretty good shape, and would fit the bill. There were some larger tandems, but some had warped hulls, and those that weren’t were out of my price range. Houston bought a 17 ft Tsunami for his fast boat, but he also picked up a 12 foot Dagger Axiom for river exploration. This is a new hybrid model which features high maneuverability, but also has a drop-skeg for straight tracking on flat water. Chip bought a beautiful 17-ft Perception Essence with composite hull, rudder, and drop-skeg. We also found a 14.5 ft Tsunami off to the side for an unbelievably log price. It had “shop boat” written in Sharpie marker on the sides and had some scratches and dings, but appeared to be in good shape otherwise. It joined our collection. As with our last Lake Fairfield Paddlefest, all of the new boats wound up at our house for a test drive on our little lake. We took out several of these, making sure that there were no glaring flaws in the boats we had just purchased. I took the Tsunami 145 out, and it seemed to dance over the water. It performed beautifully. To have been so inexpensive, it really caught us by surprise. The tandem was another matter. Houston and I thrashed about causing more paddle collisions than anything. I did take it out solo, and it did fine. Houston’s new Axiom did great, pivoting when the drop-skeg was up, and tracking straight as an arrow when it was down. Before Saturday evening’s game between Furman and USC, Laura and I decided to take the tandem out to Lake Cunningham. Initially we had some of the same problems as Houston and I had. The boat was a bit unwieldy. We readjusted her seat forward, and that decreased the problem of clashing paddle blades. Even so, it seemed like a heavy, lumbering boat. Late Sunday afternoon Chip, Anna, and I took a Pungo 120, Chip’s new Perception Essence, and the Tsunami 145 out for one more shake down, this time on Lake Robinson. I used to think the Pungo was a fairly fast boat, and it is. While paddling it kept up with the other two. However, it didn’t continue to glide as smoothly, and it took more effort to get it up to, and keep it at the same speed as the long boats. The Tsunami once again did great. It’s not the most maneuverable boat on the water, but it did fine. I still couldn’t find any flaws to justify it’s cheap price. Chip let Anna take over his new boat, and she loved it. I think she’s hooked, and would love to have her one of her own. The sun was setting, and we only had time for a quick paddle. I’d love to take the Tsunami up to Lake Jocassee and see if I could get to more of the waterfalls in it. I may just have to do that this fall. How about two æ´¥æ³¢ / æ´¥æµª (ã¤ãªã¿ (tsunamis) on a Jocassee trip? Mine needs an adventure. Sounds great! But, just so you know, I almost trashed your comment as spam because of the Japanese characters. I really don’t mean to be racist, but sometimes technology gets the best of me! I ran across your Google map of SC rivers and was stunned at the amount of information. I float the rivers too…not for fun but to fish…which I have a lot of fun doing if not always successful. I was looking at your Savanah River section near Augusta and thought to give you another float that is upstream of yours. Here is a pic of the float access and it is a great float. First is the float plan and next is a link to pics I took along the float. Hope this helps and thanks for your contribution to river access! Thanks for the kind words! 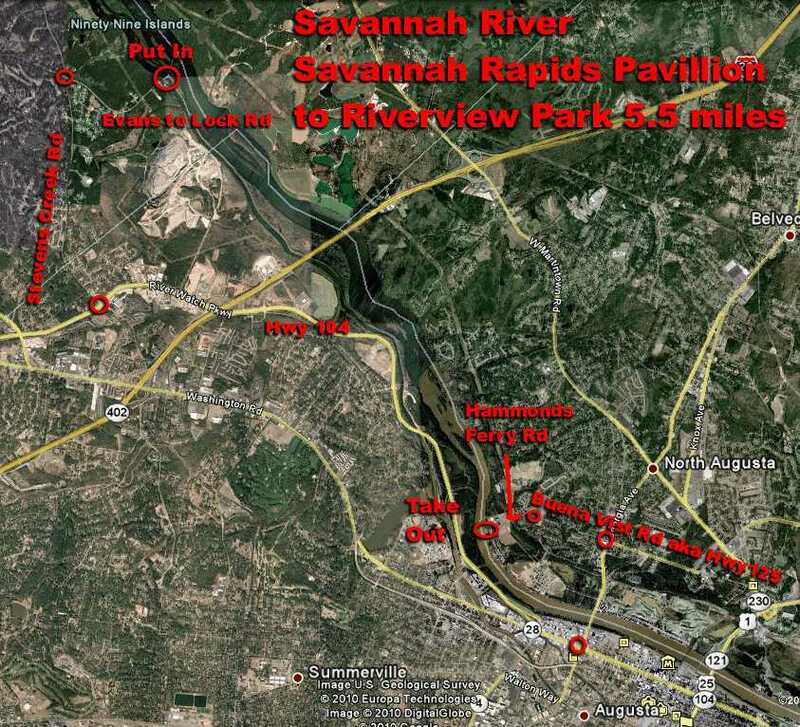 I also appreciate the additional information about the Savannah. I’ll add that the list, and gladly give you credit. You’ll have to join us for one of our future adventures. I see this is from 2010, but I am headed to the upcoming 2011 confluence sale and wondering what to expect as far as prices go. I have been looking at a 12-17ft perception carolina ..or possibly a similar model wilderness systems kayak. do you recall the price on the 17 ft Tsunami you purchased a year ago? thanks!